Cullen Herman was diagnosed with Lyme disease shortly after this photo was taken. Headaches, touch and light sensitivity, and nervousness are common manifestations of Lyme disease. 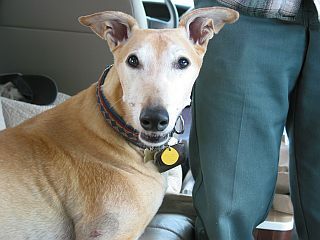 Cullen is the dog on the Home Page; note the difference in his demeanor between healthy and sick. There is a relatively long latent period between exposure (i.e., tick bite) and symptoms – approximately two to five months. Lyme disease presents in dogs primarily as arthritis; this arthritis may be short-lived and may even recur. It may involve one or several joints, and may have a sudden onset. An infected dog may appear depressed, feverish, unwilling to eat, or lethargic. The dog may also be unwilling to move. Joints may appear swollen or hot and may be painful when examined. Unlike humans, dogs generally do not show signs of the red, round, target-like skin rash that many people develop (erythema migrans), nor do they develop the unrelenting chronic arthritis or involvement of the nervous system that may appear in severe, untreated Lyme disease in humans. Rarely, dogs may present with kidney disease, seizures, and/or behavioral changes. Lyme disease may be diagnosed as early as four to six weeks after the tick bite, when the dog develops antibodies to Lyme. Tests can confirm the presence of an acute infection in vaccinated dogs in whom active disease is suspected. Lyme disease is generally treated with tetracycline, doxycycline, or amoxicillin for 21 to 28 days. An infected dog will usually show clinical recovery within one to two days. Dogs respond well to treatment with these antibiotics and complete recovery is usually expected. I have looked at many sites and have not come across a site like yours that tells everyone everything they need to know. I have added you to my bookmarks, can anyone else suggest other related topics that I can search for to find out more information?